On my search for interesting design I found out about Antony Poels. His work with steel is very interesting, creating organic forms and very cool 3D effects. Antony kindly agreed to my request for an interview and here it is. Antony Poels was born in Surrey and has lived in Worcestershire since 1978. Amongst his work he reproduced classical sculptures for Anthony Redmile in London like the Caesar busts in the film ‘Gladiator’ and a memorial to Diana, Princess of Wales at Burghley House, Stamford. 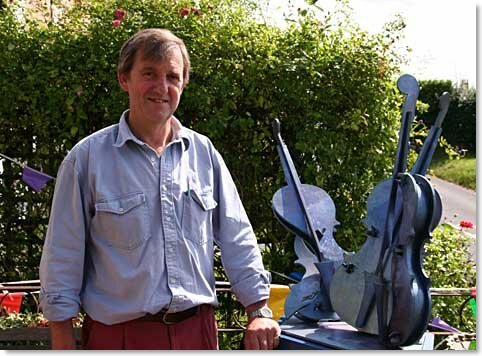 Also at Burghley House, Antony worked closely with the famous garden designer George Carter, in the creation of many of the automatons and sculptures in the Garden of Surprises. As his tutor would constantly say ‘work between the shapes and let the viewer discover the line’. 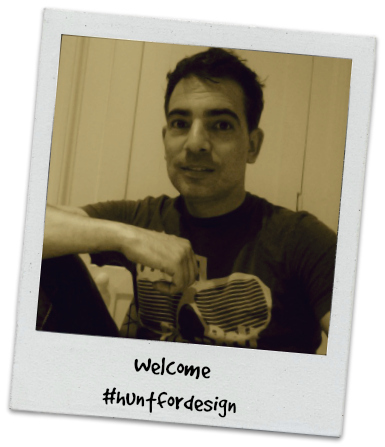 Hunter: You have learned alongside very influential artists; painters, sculptors, garden designers. Who would you consider as the most influential one in your career and why? Antony Poels: I would consider Gwilym Pritchard to be the most influential person in my career. He was my art tutor and he encouraged me to explore my artistic talents from an early age. H: When did you realise you wanted to become a sculptor? A.P: I have always enjoyed creating sculptures, but it was in the early 1980s that the opportunity arose for me to do so on a professional footing. H: Inspiration is always key for every artist. Where do you find yours? A.P: I find inspiration from many sources, but especially from nature and topical events and general day to day observations of the world around me. H: Seeing your collection I definitely have to ask you about your technique. The 3D effect you achieve in every piece is very impressive. What can you tell us about the materials and the skills needed? A.P: The sculpture is determined by the materials with which I am working and my most recent collection has been created specifically to take advantage of the engineering capabilities that heavy plate steel has to offer. All the sculptures in this range are built up from the shadows of the subject and consequently they give great movement when you walk around them. 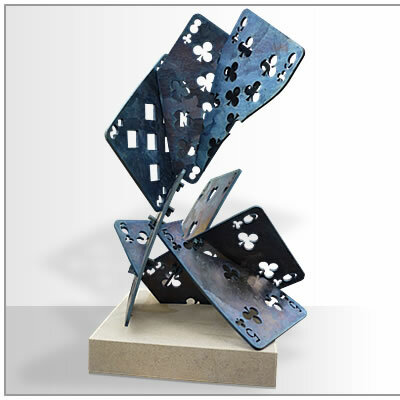 Playing Cards on a sandstone base – Ht 41” (104cm) Materials – mild steel which is then zinc nickel plated for interior or exterior protection. H: How long does it take (on average) from when you decide about the piece and the final artwork? A.P: It is difficult to determine the exact time scale as each piece is different, but on average it will take approximately 5 months from the conception of an idea to its completion. H: I think your pieces fit perfectly in different outdoor spaces. Are all of them meant to be outdoors, or do you design them without considering their final placement? A.P: They are all equally suited for placement both inside or out. H: Some pieces are available to buy on your website. Do you work on your own pieces or mostly commissioned? A.P: The latest range is my own, but the majority of my work comes from commissions. H: Do you have your own permanent showroom/gallery? Can people visit you at your studio to check your recent work? A.P: I do not have a showroom as such – I have not found it necessary. My clients outline their required specifications from which I initially submit drawings prior to constructing a maquette for their approval. Owing to the confidential nature of the development of some of the work in hand, I cannot permit access to my studio unfortunately. Apple Ht 37” (94cm). With pictured base- 47%22 (119cm) Materials – mild steel which is then zinc nickel plated for interior or exterior protection. H: Some of your sculptures are part of the landscape across Britain. 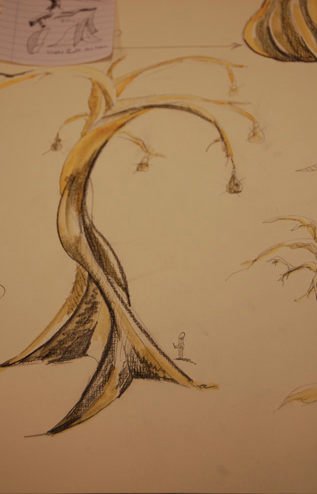 Tell us about the Worcestershire Pear Tree Foundation and the piece you have created. 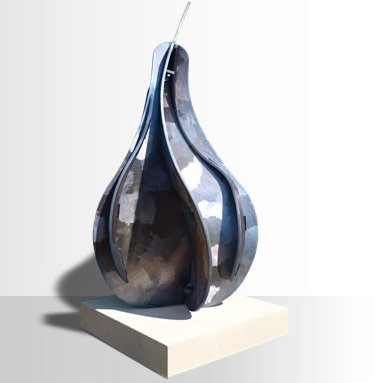 A.P: My latest project is The Worcestershire Pear Tree, which will be a 21 metre high sculpture to be placed alongside the M5 motorway in Worcestershire (my home county). The inspiration came form The Angel of the North, which has been such an iconic landmark for the NE of the country and the Pear Tree will hopefully have a similar impact on Worcestershire. H: For every artist there is a piece that makes them proud. Which one would be yours? 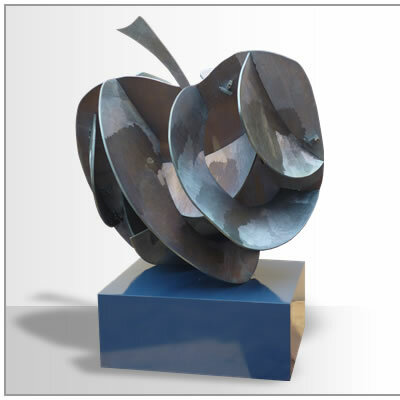 A.P: Each sculpture I create gives me a sense of pride and achievement at the time, but I think unquestionably the Pear Tree, owing to the sheer size and impact it will hopefully generate, will have to be my proudest achievement. Here is a video where Antony explains in more detail his latest project. We are looking forward to seeing it finished! The Worcestershire Pear Tree Foundation LTD. Previous Post Hello Fresh, dine at home.